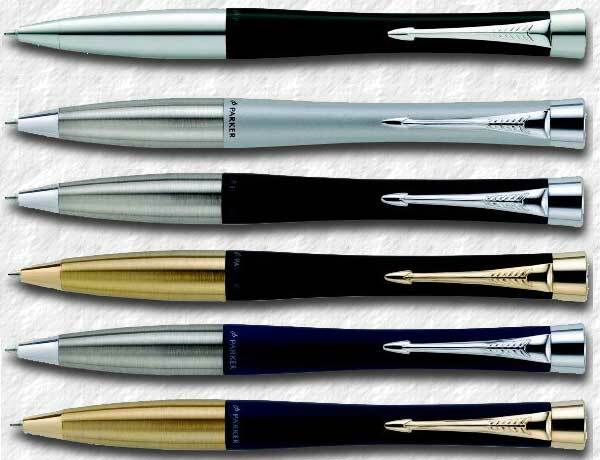 he Parker Urban has been described as the ball pen with an attitude. The ergonomically bullet-shaped design was derived from the Dimonite but instead of ending in a cylindrical metal button, the Urban ended with a big, fat clip screw that held down the clip, not unlike the ones found on the high class Duofold pens. It had ametallic with acrylic resin finish and gold or chrome-plated accents that is surprisingly heavy for a pen aimed at the low to medium market segment. While the Dimonite was button actuated the Urban ball pens are twist actuated. During the first line up only ball pens were offered. Fashion Laque Pink CT lready in mid 2008 the line was enhanced with a twist action pencil and a cap actuated roller ball. The latter had a new style cap that echoed the bullet shape of the body, ending in a thinner and smaller clip screw. The cap also had a thin metal cap lip. The Silver CT was now renamed Cityscape Silver CT, the Matte Black became Muted Black, the Matte Blue Night Sky Blue, the Metallic CT became Metro Metallic while the Matte Khaki was discontinued. In the Fashion series the Laque Black was renamed London Cab Black CT, the Silver CT became the Fast Track Silver, the Blue CT became the Bay City Blue and the Pink CT transformed into the Cool Magenta. In 2009 this line-up remained but an attractive fountain pen was added, following the design of the roller ball. It was fitted with a stainless steel nib that was offered in the standard nib grades of fine and medium only. It utilised a convertor or cartridges.